Public clouds have been promoted as an easy way to augment your on-premises infrastructure, allowing you to back up your data without buying more storage, move workloads to speed development or even fast track new business initiatives. But many don’t stop to consider the potential challenges of leveraging the public cloud, such as managing data and workload migration or standing up a cloud-based DR site. The complex reality of managing a hybrid cloud environment can feel overwhelming! 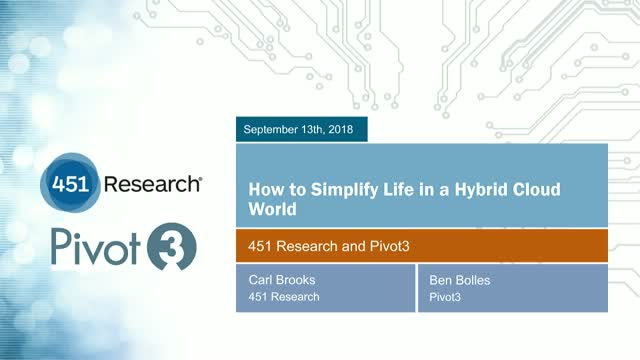 Join the 451 Group, a preeminent information technology research and advisory company and Pivot3, a leading hyperconverged infrastructure and hybrid cloud provider, to learn how to simplify the deployment and management of a hybrid cloud environment using automation and intelligence.